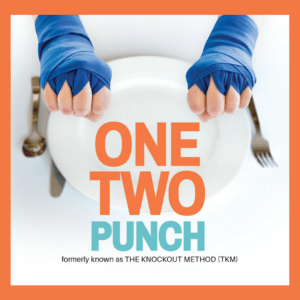 The first, and most crucial part, of the ONE-TWO PUNCH is BURN; eating when you are hungry. Think of your stomach as an incinerator. When the incinerator door is open (when you’re hungry), your body will BURN and use anything you put in it. When you feel hungry, it’s your body’s way of indicating you need fuel and it will BURN it. As you eat, the incinerator door begins to close. Once closed (when your body signals that it’s full) you have more potential for storing the extra food. It’s as if the body says, “I only needed enough fuel to fill the incinerator, I guess I’ll have to store the extra.” The extra is stored as fat. That happens when you eat past the point of fullness, but also when you eat when you’re not hungry in the first place. So the first step is trying to eat only when you feel hungry. To figure out what hunger feels like, sign-up for a FREE download. 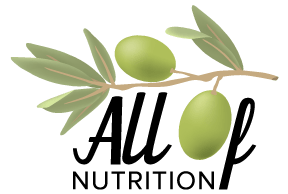 Once you’ve determined that you are hungry, you need to BALANCE the protein and carbohydrate going into your incinerator to stabilize your blood sugar and feeling of fullness. The ONE-TWO PUNCH allows you to do this without measuring, counting or tracking. Make a fist; that’s the portion size of carbohydrate and the portion size of protein you need every time you’re hungry and decide to eat – a fist of carb and a fist of protein. This BALANCE of protein and carbohydrate creates the perfect knockout punches. Carbohydrate without a protein anchor can spike blood sugar levels and leave quickly, leaving you hungry again (sooner) for more carbohydrates. Protein slows the entrance of carbohydrates into the blood and the BALANCE keeps you satisfied longer. Now it’s time to put it all together. BECOME is putting into practice the first two components, BURN and BALANCE. It takes practice to decipher physical hunger from other emotions you might feel. It takes practice to estimate a fist-size portion of protein and a fist-size portion of carb when you eat. You need to practice choosing options of protein and carb that are most helpful to you in a particular circumstance. Practice is a verb – it’s doing. As you practice the concepts of BURN and BALANCE you’ll develop a healthy lifestyle that works for you – both physically and mentally – to BECOME the you you’ve always wanted to be. Understanding and implementing these three steps will help you build a foundation for the ONE-TWO PUNCH. You can find more information about each step, along with other factors that are crucial to the ONE-TWO PUNCH on our blog.